Written for Daily Hive by Roy Hessel, President and CEO of Clearly, founder and CEO of EyeBuyDirect, and a supporter of better vision for everyone. There’s no doubt that thousands of consumers will be rushing to buy Snapchat Spectacles now that they’re officially available to purchase online. But what about the kinds of glasses we actually need? I’ve been in the online eyewear business for a dozen years, and I’d like to think that people trust me to know my stuff. And yet when my trainer came to me the other day asking for eyewear advice, she told me she’d probably look at some glasses at the store before shopping on our website. I hear this all time. People nowadays go online for 51% of their shopping rather than buying in stores. They’ll buy cheese, wedding dresses, home appliances — you name it — on the internet. And yet many shoppers are hesitant to buy glasses the same way. In fact, the overwhelming majority of glasses are still purchased in stores. I understand shoppers’ reluctance. Glasses are personal and they’re right on your face for everyone to see. People are concerned about quality, about having the right prescription, about returns and — above all — about fit. Unfortunately, many people are still missing out on some big advantages to shopping online for eyewear. Possibly the biggest: glasses can be cheaper online compared to in stores. And if you’re not worried about a fashion-house label, you can find a wide selection of quality eyewear for even less. Thankfully it’s getting easier to buy glasses with a few clicks, especially if you bear a few key tips in mind. Getting your eyes examined from a qualified optometrist or ophthalmologist — an eye doctor — is the critical first step to getting any kind of prescription eyewear. This is important not just to ensure you get the right prescription, but to protect the overall health of your eyes. Experts recommend you should have your eyes examined every year or two. Being proactive during the exam can make a huge difference when it comes time to choose the perfect glasses. Be sure to ask your eye care professional for your written prescription, for starters. It’s also a good idea to ask for your pupillary distance (PD), a simple measurement of the distance between your eyes (you can also find guides to take your own PD measurement). And don’t miss the chance to get your doctor’s input on what kind of lenses and coatings might be right for you. Strong prescriptions, for instance, generally call for high-index lenses, which are thinner and lighter. You don’t just want to see well, you want to look good, too. Good eyewear websites offer software that lets you see on-screen how your glasses will look on your face. For example, on EyeBuyDirect you can upload a picture of yourself to try out different frames, then show the pictures to your friends or share them on Facebook. If you don’t want to try out every pair of glasses, it’s worth narrowing the selection by figuring out what your face shape is first. It can be helpful to look at pictures of models with similar features as you and see what styles look best. One caveat: if you have very strong prescription, it’s usually a good idea to steer clear of larger frames, which can end up being very heavy. Let’s say you’ve found a pair of glasses you’d love, but want to know what people think of them in real life and how they actually hold up over time. 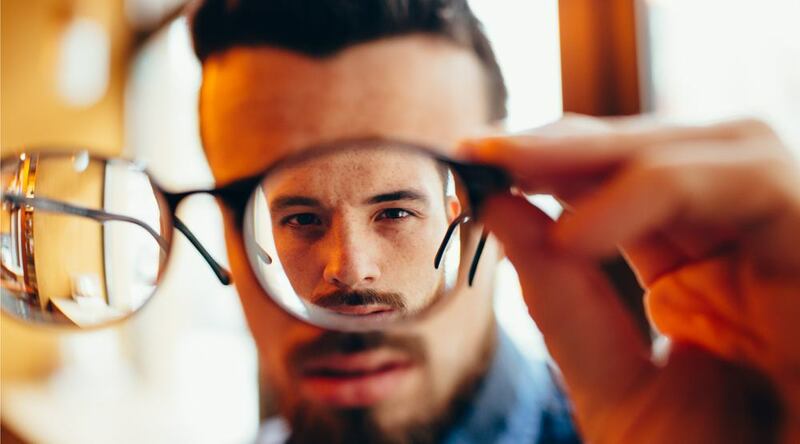 Double check the reviews: reputable sites will have an unfiltered review system for each pair of glasses. You’ll be able to see other customers’ unbiased feedback. Contrary to popular belief, these are generally true and unfiltered. Better still, you’ll hear some helpful details you may not have thought of before. Just as on Amazon and other ecomm sites, these reviews are often the most reliable way to get a 360-degree perspective on your purchase, warts and all. Eyeglass frames can be gorgeous, but their point is to hold lenses so you can see. When buying online, all lenses are not created equal. Plus, bifocals and progressive lenses present additional challenges. To make the best choice, consult a simple online guide to find out what lenses are best suited to your particular prescription. For example, if you stare at a computer, phone or tablet all day, for example, you may want to consider a digital screen protection coating, which reduces eyestrain by cutting down the amount of high-energy blue-violet light that passes through the lens. If, after all this information, you still feel a little uneasy, just be sure there’s a liberal return policy wherever you shop. Good retailers will allow a reasonable time for you to return or exchange your purchase, no-questions-asked. If they can promise you that, there’s really no reason not to take the plunge and order your first pair of glasses online.